Our Holistic Freediving Programme is specially designed to allow beginners and intermediate freedivers to learn in a non-pressured, totally supportive environment, with a caring, qualified coach. We believe that the experience is important, rather than the numbers, and our focus is on relaxation and happiness. Our Holistic Freediving programmes are about learning and personal development, and therefore there are no requirements to be fulfilled in order to complete the programme, no benchmark of whether you have 'succeeded' or not. It's about growth - at your own pace. maximum three people in any group - so don't delay! Over the past years we have seen a worrying increase in the number of freedivers pushing themselves too hard, too fast. And an ever larger number of 'new freedivers' either completing a certification programme but struggling to feel comfortable and relaxed in the water, or 'failing' to get certified because they are unable to reach certain depths within a fixed timeframe. Often instructors are under pressure to deliver certificates to up-sell students to the next level, or the instructors have no experience to help students who may be struggling with emotional issues such as fear, control, lack of confidence, which surface in the water. Holistic Freediving offers the mental and emotional support and guidance that lacks in most 'out-of-the-box' freediving certification and education programmes. We want to see smiles and happiness, not frustration and anxiety. And certainly no lung squeezes or black-outs. Too often freedivers get stuck in their heads about numbers and lose the connection to the original joy of freediving and diving without expectations. 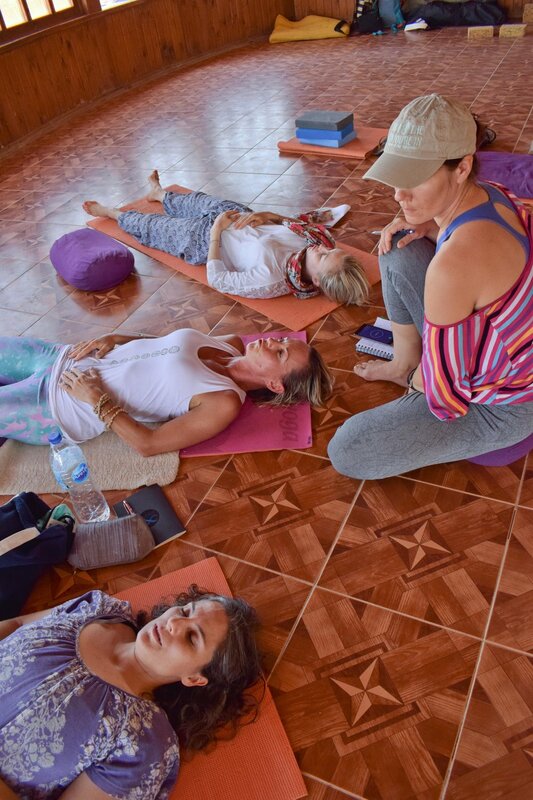 We use our experience and expertise in yoga, meditation and other spiritual practices, to focus on relaxation, mental training and self-awareness through developing the body-mind-heart connection. Our aim is to help you get back to the feeling of freediving and forget about the numbers as a benchmark of your diving experience. The holistic approach addresses each student as a unique individual. We look beyond technique to help unravel the unique emotional and mental backdrop against which each student enters the water. Holistic Freediving ensure that all factors - body, mind, and spirit - are explored through the journey of the programme. Through breathwork, meditation, and awareness, students are invited explore their inner landscape of beliefs and fears, motivations and self-sabotage behaviour. WHO IS HOLISTIC FREEDIVING FOR? Holistic Freediving is for what we call 'new freedivers'. We run two levels of Holistic Freediving; for complete beginners; and for those who have some experience of freediving through other certification programmes, but are still struggling with some aspects, particularly relaxation and/or equalisation, or want a slower, less pressured approach. FOR BEGINNERS : This programme is ideal if you want to learn how to freedive for the first time, but feel anxious about learning in a group environment, or having to reach certain depths in order to 'pass'. It is also good for people who might have a fear of water, or feel that they need to take things at a more gentle pace. Please let us know if you have any fears, or are worried about whether freediving is right for you - we will do our best to guide you honestly to the right programme. FOR INTERMEDIATES : Holistic Freediving is also ideal for those who have already started out on a certification path, but are struggling with relaxation, equalisation, or simply want to take more time than is allowed in most requirements-focused courses. Holistic Freediving has a framework and philosophy, but no requirements, meaning that each programme will be slightly different to ensure the unique needs of each student are met, one by one. If you have struggled with certification requirements, and need extra time, or more supportive, personalised coaching to help you work through specific challenges or blocks, Holistic Freediving will help you dive in a more healthy and pleasurable way - which ultimately leads to success in terms of requirements. If you are a complete beginner, please let us know so that we can run our special programme to cover the essentials for your safety and wellbeing in the water, as well as the core of our Holistic Freediving programme. PRIVATE is only available in the OPEN course dates. If you wish to have guaranteed one to one coaching for your Holistic Freediving experience, please select one of the OPEN course dates, and email us immediately so we can block those dates for you. Your payment of £250 will count as a deposit for your course and a further £100 will be payable before arrival. Once all three places are sold out on any of our programmes, you will be unable to place an order, and we ask that you look at other dates, or contact us by email to discuss your requirements. We look forward to welcoming you to your Holistic Freediving experience. For any questions or enquiries, please do not hesitate to email us to discuss your specific requirements - we are always happy to design bespoke programmes if you feel that our set programme isn't quite right for you.